We're keeping the party going this Friday and excited to welcome up and coming producer and DJ 𝖏𝖆𝖗𝖗𝖆𝖉𝖈𝖑𝖊𝖔𝖋𝖊 to Mission Disco. To show our appreciation to our loyal guests we're giving away FREE BEERS! Simply register on the link below! Bay Area Disco is proud to present our Second Annual Holiday Happy Hour Toy Drive - we will be accepting any new and unwrapped toys to donate. Last year we successfully donated to the UCSF Benioff Children's Hospital and this year we're excited to donate to the San Francisco Fire Fighters Toy Program. Don't be a Scrooge, GIVE BACK! 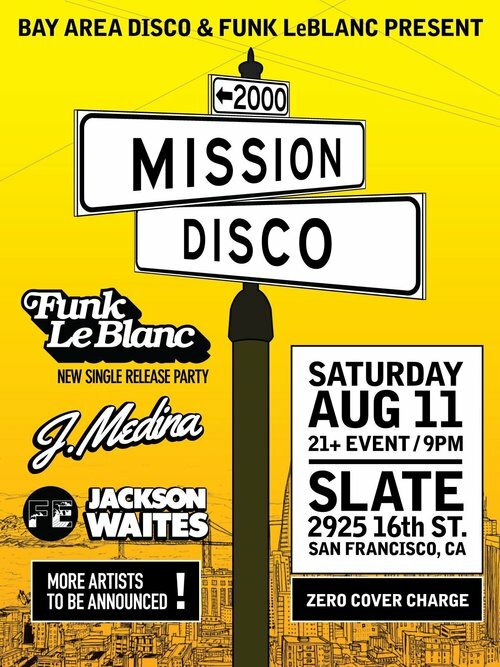 Bay Area Disco is coming back to downtown San Francisco with some old school hip-hop, R&B, and of course some disco, soul and funk to make your Friday's "FEEL GOOD!" Bay Area Disco is proud to be a part of something great this year! We're helping to spread the word for Glappitnova's annual celebration where they bring people from all walks of life together in one place while "it’s their duty to showcase, curate, highlight, and connect it to the world inspiring, educating, and entertaining others." This year's event will be held at Uber's office in San Francisco so come be a part of something special and RSVP above! We are making a bigger impression in the Bay based on the success of last year. Once a year we unite our culture, inspirations, and people from different backgrounds, perspectives, and industries in multiple cities at the same time. Chicago ends this celebration on a massive scale where storytelling, panels, perspectives, mentorship, partying, entertainment, and more intersect inside of a hip warehouse with multiple rooms to better yourself. It's raw, real, and diverse, so don't expect to be surrounded by people exactly like you. We are pleased to continue our tradition of featuring local DJs and we're excited to have Wonway Posibul, a man of many talents, one of them being an amazing DJ with plenty of success off his Makossa parties. We're also welcoming back Jackson Waites as he continues to take the Bay Area by storm with his continued success as a DJ and radio host at First Ear. Be sure to buy your tickets for what's going to be a wonderful night filled with disco, soul, funk, R&B and nu disco. A retro inspired blacklight art event reliving the fashionable/trendy psychedelic black light art scene of the 60’s and 70’s with a contemporary twist/flair or your special artistic take on St. Patrick’s Day. Visit us for the Grand Reopening of DaDa Bar - Gallery at their new location! Come out and help us support our local artists! Start your Halloween weekend right and join us at "Till Death Do Us Disco," Friday October 28th. Get your scariest, sexiest, or funniest costume and get ready for a night filled with disco, soul, funk, nu-disco, and R&B edits! Bay Area Disco is dedicated to helping our local community and focuses on giving back to all types of artists and nonprofit organizations. For this event, we're helping to raise funds for an incredible nonprofit, Sol Sisters Organization, which is dedicated to providing access to holistic health services in order to enrich, empower and evolve women of all backgrounds. We're asking guests to bring any school supplies that they would like to donate to the girls at Immaculate Conception Academy. Cover: Suggested donation with proceeds benefiting Sol Sisters Organization. Please join us for this special night of art and music raising funds to create a memorial art piece in honor of Orlando Pulse victims and in celebration of those who have dedicated themselves to supporting solidarity, unity and acceptance of the LGBT community. Featuring art works by community artists and the De Young Museum student showcase. Kick off San Francisco Pride weekend at Romper Room. This Downtown Disco series will be packed with disco, soul, funk, old R&B and disco house. Let's boogie on dooooowwwwwwnn! Art & Live Music Featuring DJ J. Medina And Live Music by Samba-West Senegal Band. Artworks selected from the de Young Annual Student Showcase. Come out this FRIDAY and support our local and inspiring artists as they help recreate an amazing psychedelic vibe with black light art over at 111 Minna Gallery! A special tribute to David Bowie! Decided to throw a huge get together at DaDa for New Years Eve. No need to stress over tickets, long lines into clubs and lounges and getting to the bar. This is simply great music with amazing company. Hope y'all can make it out. Feel free to invite friends! Coming back to Union Square with some old school hip-hop, R&B, and of course some funk and soul to make your Friday's "FEEL GOOD!"